Oscar- Academy Awards are the highest and most prestigious award given for the cinematic excellence. Sadly, In the Indian film industry history we have made a very few success in bagging The Academy Award i.e. 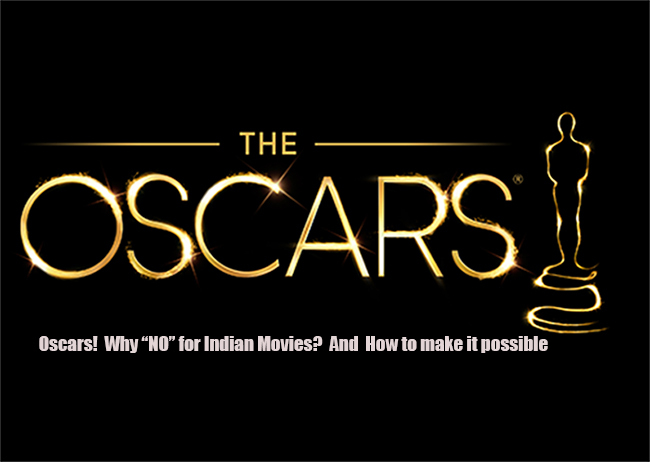 Oscar Indian film making industry takes entertainment as sole factor and it is completely now transform as a business game. Recently the film industry celebrates 100 years of glorious completion, in these duration, forty five Indian films were sent in the category of foreign language movie but merely three movies made in nomination of academy award committee- Mother India (1957), Salaam Bombay (1988) and Lagaan (2001). This is a very serious question that where do film makers lack? Even after being so versed in this field and being so popular across the world, Movies aren’t up to the mark. If we will try to find the pattern that what are those key factor which make a great movie. Then we will find that it is always a story. The story is the soul of any movie. If we take theses selected movie for instance, they are the original and penetrative shade of our culture which is to only happen in India. It has something to do with our essence which made it earn the nomination for best movie in foreign language. Obviously, to be best we have to what no one else is, but we rarely find any such movies today. The nominations like Satyajith Ray’s “Pather Panchali”, “Salaam Bombay”, “Lagaan” or “Mother India” are solely Indian and they say the story of what India is! Similarly, if we talk about the other nomination sent from India, for instance “Barfi”, the academy award selection committee rejected because they claim that the story which can happen anywhere across the world. They are good example of movie making but yet they aren’t compatible with what required for being in nomination for best foreign language film. The recent examples of Best Foreign language movie nominations like “Ida”, a Polish Drama directed by Pawel Pawlikowski and “Amour” by Michael Haneke will make you feel the deep roots of culture, the efficient knitting of emotion and honest treatment making it unique creation which touches heart instantly. The movie like “Court” by Chaitanya Tamhane and “Swaapnam” are good examples of movies dealing with the root and has an original story of our culture. If we come to other criteria of award then, A R Rehman and Gulzar were awarded Oscar for Best Music and lyrics respectively in 2008 for Slumdog Millionaire. But it is remarkable that it was a foreign director with Indian cast, the same story is repeated with “Life of Pi”. It clearly reflects that we have potential but we are lacking in honest efforts from our end. To add on this list, Vidhu Vinod Chopra and Ashwin kumar were nominated there short film, “An encounter with Faces” and “Little Terrorist” in short film nominations. If we come to facts than the first Oscar for India was given to Bhanu Athaiya in 1982 for costume design for “Gandhi”. It seems so less for a 100 year long journey. We definitely need to take some tips and learn some techniques and when it comes to potential we are nevertheless with it! It just the matter of some extra and more creative efforts from our ends! “Life is all about exploring your potential beyond limits”, says Neha. A small town girl with big dreams for her life. She is the student of Fashion communication at NIFT. She has a long list of hobbies which enlists Dancing, singing, writing, composing, reading, painting, cooking and watching movies. Neha is much passionate about writing and believes that your write ups are the best medium to communicate and pass on your thought to other because the person reads it in silence and do not argue back in between, so you are able to place exactly what you intended to say. Her life is all about being creative and pushes her imagination level to that extent which sets her as a Best seller novelist and let her reader leave in the world of fancy. These Behind The Scenes Secrets of Harry Potter will Blow your Mind!